Following the success of their own cycle to work scheme, a leading bus operating company has taken steps to ensure that its drivers are more aware of road users on two-wheels. Stagecoach London has developed a training programme in conjunction with Cycle Training UK to encourage its bus drivers to empathise with people on bicycles and understand how to minimise the risk whilst sharing road space with cyclists. This is part of a London wide initiative to train drivers of Light Goods and Passenger Carrying Vehicles through an accredited Certificate of Professional Competence (CPC) course called ‘Safe Urban Driving’. Stagecoach London took the decision to develop its own CPC cycle awareness training which is to be delivered in-house by their driver training team. 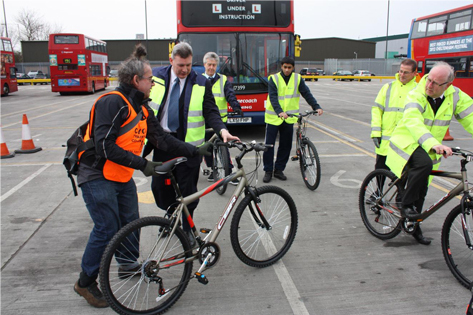 This is the first time that on-bike training has been delivered in-house by a UK bus operating company. David Dansky, Head of Training & Development for Cycle Training UK, with the newly qualified team of Cycle Instructors at Stagecoach London’s West Ham depot. Stagecoach Group has seen an increase in the number of its own employees taking up cycling following the successful launch of the UK Government backed Cycle to Work scheme to its own employees in 2012. A total of 1,498 employees were attracted to the savings available through the scheme. Cycle Solutions, the company that provided the cycle to work scheme, donated the bicycles which are used by the Stagecoach cycling instructors when delivering the training. Census results show a 17% growth in cycle commuter numbers over the last decade with statistics showing that in England and Wales 760,000 people now cycle to work, up from 650,000 in 2001. 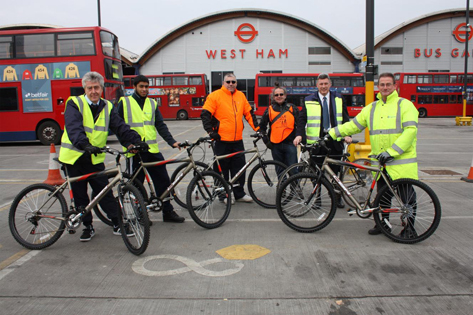 Stagecoach London plans to start running the Cycle Awareness training for their new and existing drivers at the West Ham depot in the summer.